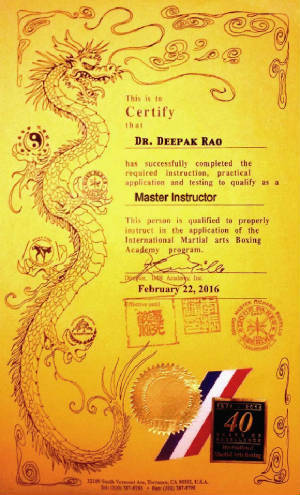 One of the great things about my job or as a martial artist is that it has given me opportunities to work with some of the greatest names in their respective fields. 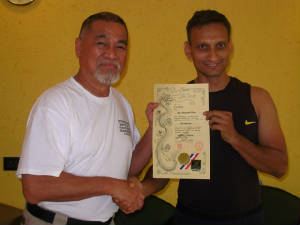 In fact it has always been more than just about work, as these same martial artist and instructors have also become some of my dearest friends. 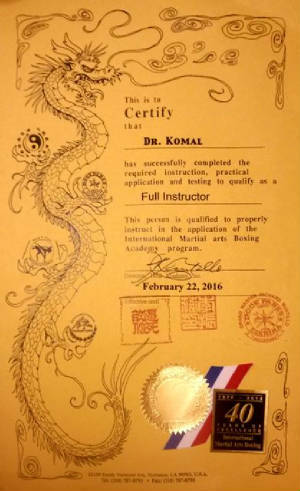 I’ve been lucky to be surrounded by the best in regards to growing from training in martial arts, law enforcement defensive tactics training and reality base self defense. Out of all the names in Asia, one kept coming to the top. 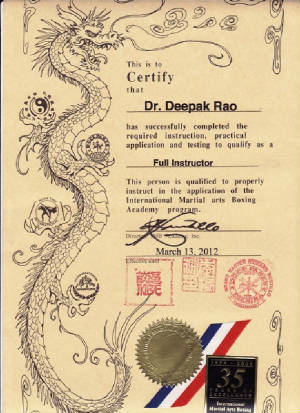 And that name is Dr. Deepak Rao and Dr. Seema Rao. 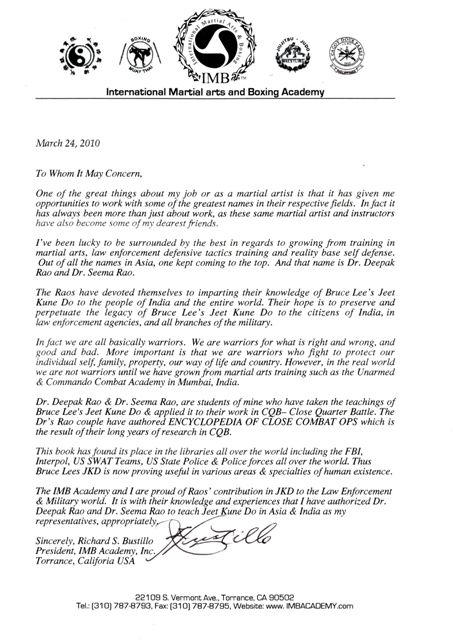 The Raos have devoted themselves to imparting their knowledge of Bruce Lee’s Jeet Kune Do to the people of India and the entire world. 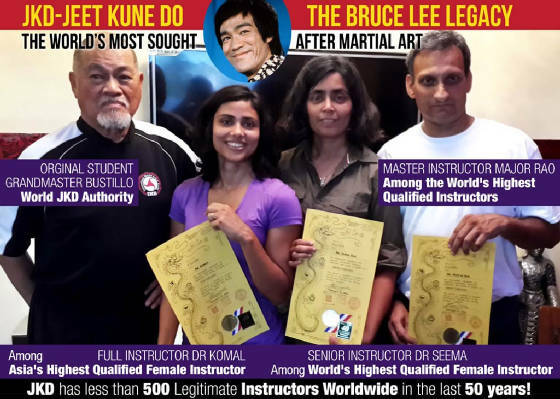 Their hope is to preserve and perpetuate the legacy of Bruce Lee’s Jeet Kune Do to the citizens of India, in law enforcement agencies, and all branches of the military. In fact we are all basically warriors. We are warriors for what is right and wrong, and good and bad. More important is that we are warriors who fight to protect our individual self, family, property, our way of life and country. 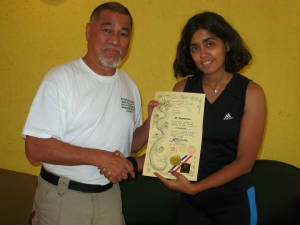 However, in the real world we are not warriors until we have grown from martial arts training such as the Unarmed & Commando Combat Academy in Mumbai, India. 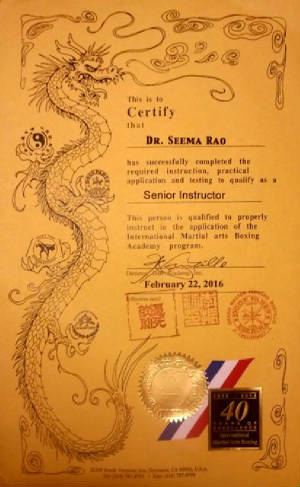 Dr. Deepak Rao & Dr. Seema Rao, are students of mine who have taken the teachings of Bruce Lee's Jeet Kune Do & applied it to their work in CQB– Close Quarter Battle. 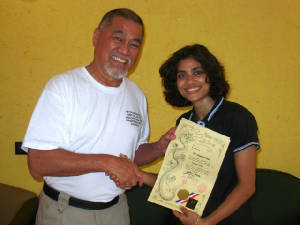 The Dr’s Rao couple have authored ENCYCLOPEDIA OF CLOSE COMBAT OPS which is the result of their long years of research in CQB. This book has found its place in the libraries all over the world including the FBI, Interpol, US SWAT Teams, US State Police & Police forces all over the world. 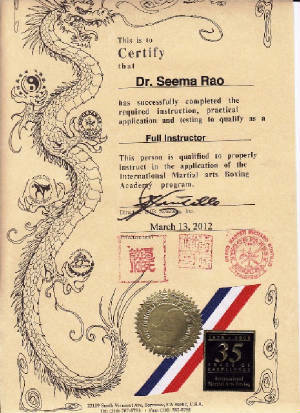 Thus Bruce Lees JKD is now proving useful in various areas & specialties of human existence. 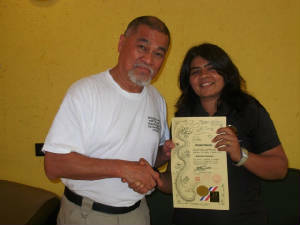 The IMB Academy and I are proud of Raos’ contribution in JKD to the Law Enforcement & Military world. 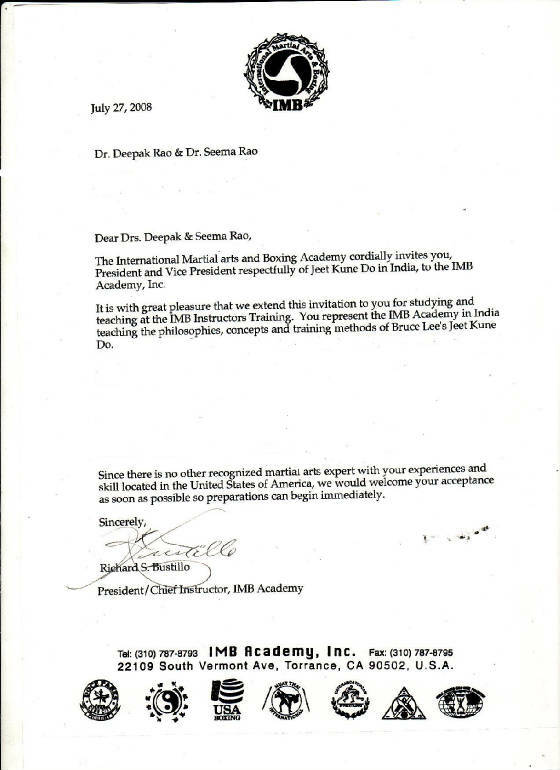 It is with their knowledge and experiences that I have authorized Dr. Deepak Rao and Dr. Seema Rao to teach Jeet Kune Do in Asia & India as my representatives, appropriately.